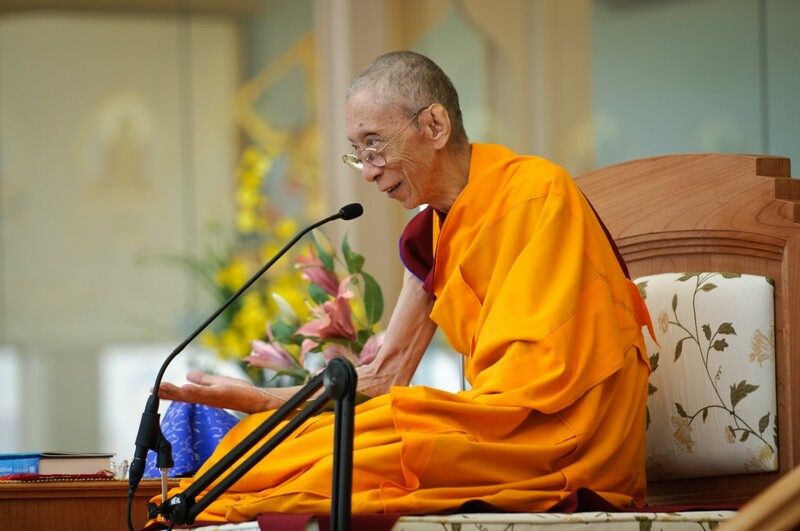 Geshe Kelsang Gyatso is a fully accomplished meditation master and internationally renowned teacher of Buddhism. Geshe-la, as he is affectionately called by his students, is primarily responsible for the worldwide revival of Kadampa Buddhism in our time. Born in a remote village high on the Tibetan plateau in 1931, he ordained as a Buddhist monk at the age of eight and spent the next twenty years studying the teachings of Buddha in the great Tibetan monasteries. After concluding his studies and being awarded the title ‘Geshe’, which means ‘virtuous spiritual friend’, he entered a life of meditation, engaging in deep retreat at first near the Nepali border and later in the mountains of northern India, where he soon developed a reputation as a great meditator, with many coming to regard him as a modern day Mahasiddha. After almost twenty years in retreat, in 1977 at the behest of his own Spiritual Guide, Kyabje Trijang Dorjechang, Geshe Kelsang graciously accepted an invitation from Manjushri Center to travel to the West and become the Resident Teacher at what was then a fledgling Buddhist center that had recently acquired Conishead Priory as its base. Since that time Manjushri Center has been Geshe Kelsang’s spiritual home, where he has given thousands of teachings. Many of these teachings have been published in 22 highly acclaimed books on Buddhism and meditation, including his latest title, Modern Buddhism. BUDDHISM AND MEDITATION FOR THE MODERN WORLD The New Kadampa Tradition – International Kadampa Buddhist Union is an international association of Mahayana Buddhist study and meditation centres that follow the Kadampa Buddhist tradition founded by Venerable Geshe Kelsang Gyatso. To realize this wish he has trained hundreds of qualified Western teachers who are making Buddha’s teachings available to people in their own language, according to their own culture. Every Kadampa Buddhist Center has a Resident Teacher who has either completed, or is studying on the Teacher Training Program. This program entails the study of twelve subjects based on Geshe Kelsang’s books, various meditation retreats, and a commitment to follow the Buddhist way of life sincerely and purely. These teachers hold the lineage blessings of Kadampa Buddhism and are able to teach all of Geshe Kelsang’s books. They are also available to give personal meditation advice. To have such experienced and supportive teachers who can give encouragement and advice in our own language is a completely new development in Western countries. It is one of Geshe Kelsang’s most precious gifts.THE IMPORTANCE OF TEACHER TRAINING. In a talk on the benefits of the Kadampa Study Programs, Geshe Kelsang says: ‘Buddhadharma is beneficial to others only if there are qualified Teachers. Without Teachers, Dharma texts alone are of little benefit. To become a qualified Dharma Teacher requires special preparation and training. It is not easy to become a Dharma Teacher because special qualities are needed: wisdom, correct view, faith, conviction, and pure conduct as an example to others. Also a Teacher needs an inexhaustible reservoir of Dharma knowledge and experience to teach from, otherwise he or she will dry up after one or two years. If a Teacher lacks qualities such as wisdom, experience, faith, and pure motivation, it will be difficult for others to develop faith in them or their teachings, and there will be little benefit. Also, without proper training and preparation there is a danger of Teachers mixing worldly, samsaric activities with their teaching activities. Therefore we definitely need to train well if we wish to be a genuine benefit to others.’The purpose of the Teacher Training Program is to provide an extensive presentation of particular subjects of Mahayana Buddhism to enable practitioners to deepen their knowledge and experience of Buddhism, and to train as qualified New Kadampa TraditionTeachers. All Resident Teachers of Kadampa Buddhist Centers follow this in-depth program of study and practice. TWELVE SUBJECTS The program comprises the following twelve subjects, based on Buddha’s Sutra and Tantra teachings and the corresponding commentaries by Venerable Geshe Kelsang Gyatso: 1. The Stages of the Path to Enlightenment, based on the commentary Joyful Path of Good Fortune 2. Training the Mind, based on the commentaries Universal Compassion and Eight Steps to Happiness 3. The Heart Sutra, based on the commentary Heart of Wisdom 4. Guide to the Bodhisattva’s Way of Life, based on the commentary Meaningful to Behold 5. Types of Mind, based on the commentary Understanding the Mind 6. Guide to the Middle Way, based on the commentary Ocean of Nectar 7. Vajrayana Mahamudra, based on the commentary Clear Light of Bliss 8. The Bodhisattva’s Moral Discipline, based on the commentary The Bodhisattva Vow 9. Offering to the Spiritual Guide, based on the commentaries Great Treasury of Merit and Mahamudra Tantra 10. Vajrayogini Tantra, based on the commentary Guide to Dakini Land 11. Grounds and Paths of Secret Mantra, based on the commentary Tantric Grounds and Paths 12. The Practice of Heruka Body Mandala, based on the commentary Essence of Vajrayana FURTHER INFORMATION Read Wishfulfilling Jewels for Dharma practitioners by Geshe Kelsang Gyatso The Teacher Training Program takes approximately twelve years to complete and requires an enrollment procedure. To find out more about the Teacher Training Program contact your local center. Gen Norden also knows how to teach General Program classes great for beginners. The General Program introduces basic Buddhist view, meditation and action, along with various other teachings and practices, all within the Mahayana Buddhist tradition of Atisha and Je Tsongkhapa, to help practitioners deepen their knowledge and experience of Buddhism. All the teachings are based on commentaries by Venerable Geshe Kelsang Gyatso. The General Program is taught at every Kadampa Buddhist Center and is an ideal starting point for those interested to find out more about Buddhism and meditation. The program consists of drop-in classes (evening and lunchtimes), usually supplemented by optional day courses, weekend courses, and meditation retreats. All classes are open to everyone. Some centers also provide special classes for children. SUBJECTS COVERED BY THE PROGRAM Who was Buddha? Understanding the mind. Past and future lives. What is karma?Our precious human life. What is meditation. Death. The Buddhist way of life. What is liberation? Developing renunciation. The three higher trainings. Becoming a Bodhisattva. The Bodhisattva’s way of life. Ultimate truth. Enlightenment. To find out more about General Program classes near you, contact your local center. BENEFITS OF THE FOUNDATION PROGRAM. The benefits of studying and practicing these texts are as follows: Joyful Path of Good Fortune – we gain the ability to put all Buddha’s teachings of both Sutra and Tantra into practice. We can easily make progress on and complete the stages of the path to the supreme happiness of enlightenment. From a practical point of view, the Stages of the Path is the main body of Buddha’s teachings, and the other teachings are like its limbs. Universal Compassion and Eight Steps to Happiness – we gain the ability to integrate Buddha’s teachings into our daily lives and solve all our human problems. Heart of Wisdom – we gain a realization of the ultimate nature of reality. By gaining this realization we can eliminate the ignorance of self-grasping, which is the root of all our suffering. Meaningful to Behold – we transform our daily activities into the Bodhisattva’s way of life, thereby making every moment of our human life meaningful. Understanding the Mind – we understand the relationship between our mind and its external objects. If we understand that objects depend upon the subjective mind, we can change the way objects appear to us by changing our own mind. Gradually we shall gain the ability to control our mind and in this way solve all our problems. FURTHER INFORMATION Read Wishfulfilling Jewels for Dharma practitioners by Geshe Kelsang Gyatso. The Foundation Program takes approximately five years to complete and requires an enrollment procedure.